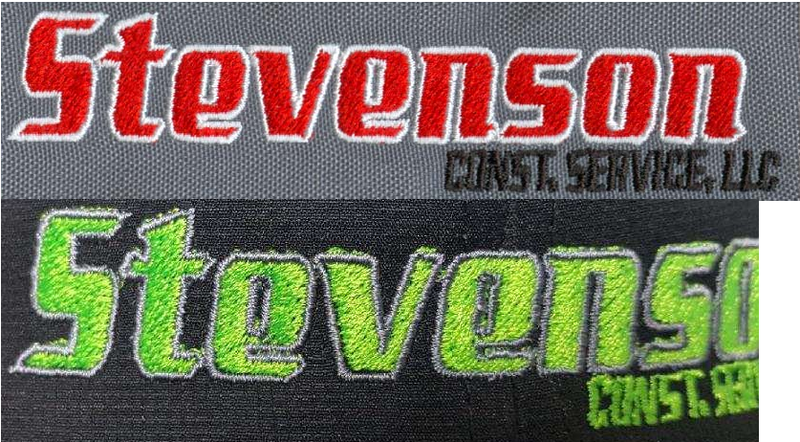 The reality of commercial embroidery is such that digitized logos will often work perfectly in a test environment but when it comes to production the wheels will fall off the bus and edits will be required. Take a look at the image below. Another reality is this, there is more than one solution to this problem and ultimate resolution depends on many factors. Furthermore, what often happens in the real world is this: even though this design was programmed specifically for caps an embroiderer might sew this logo on something like a jacket or sweatshirt and get perfect results without any editing required at all. What must be realized is there is more than one way to the finish line and many times it will take more than one technique to get a design to sew perfectly. Typical hat digitizing technique requires a design be programmed to sew from the bottom up and center out. That is exactly how this design was programmed. 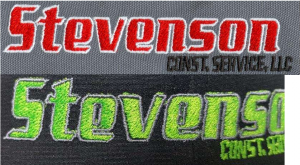 Then, to help with registration after embroidering the bottom text the design embroiders the fill for the letters, “evets,” borders the same and then embroiders the fil for, “nson” and its respective border. In theory this should work great. In reality what happens is as the cap moves around in the cap frame during the embroidery process and by the time the borders are sewn the design no longer registers properly. What to do then? There are a few different techniques that can be applied. 1. Maintain the bottom up center out programming but border each letter immediately after it is filled. In this case that means sew the fill on the E then the border on the E, fill on the V border on the V, etc., etc. through the full word Stevenson. This will add color changes but will allow for less movement in the design and better registration. 2. Add column width to the borders on the letters which will provide a little more room for imperfection. 3. Examine the production sample carefully and make changes to the programming based on what you see. In this example you can see that the registration issues show a consistent trend where the stitching is pulling from the bottom, up and to the right. This is evident because there are gaps at the bottom of the letters and stitches peeking out from the top. This can be corrected through editing by adjusting the fills so that on the bottom of the letters the fill moves closer to the outside edge of the border and at top, bring the fill in from the outer edge. It should be noted, this is a trial and error process and can be frustrating. The images below show these applied. In the “graphic” example the top version is the original file and the bottom is after editing. The added column width is obvious but a close review will show the fills have been shifted down and to the left. The sewn sample below the graphic is the embroidered result. The moral of the story is, it will often take more than one technique to get to the finish line. But here is the irony, at the end of this project the customer wanted the borders removed. The most important take-away from the conversation is this; editing is part of the embroidery process. Even if you had the best digitizer in the whole world sitting in your shop she will, from time to time need to edit designs to make sure they run well on your machines. If that “programmer person” turns out to be you it is critical to understand that successful editing will almost always involve using more than one technique to get you to the finish line.